Are you a business that needs a printer that can give you the best looking images imaginable? Do you need a full color solution that can give you prints that are guaranteed to make a statement? If so, then the Xerox WorkCentre 7556 is the perfect solution for you! 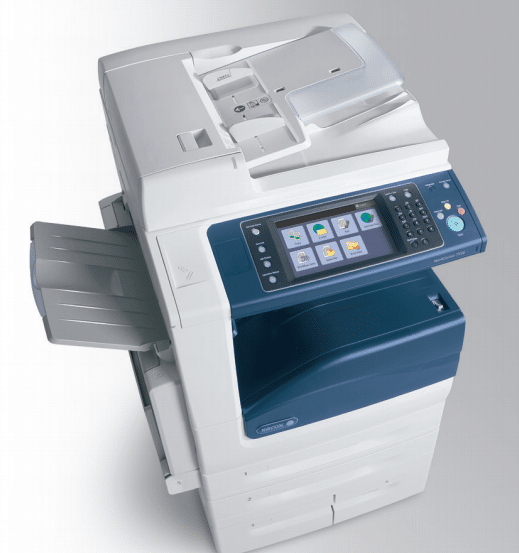 The Xerox WorkCentre 7556 will give you the best looking prints you can imagine with an in-house machine. With a print resolution of 1200 x 2400 DPI you can know that your prints are going to come out looking as real as can be. This versatile printer can handle just about any print job you can imagine. It comes equipped with the technology you trust from Xerox to get your print jobs done. Tabloid sized printer. Print sizes up to 12.6” x 19”. This printer can handle even the most color-specific jobs. It’s full color capability and intense print resolution let you produce photo-realistic prints on larger paper than most printers can handle. You can rest assured knowing that this printer will produce prints that will be the envy of anyone who sees them. The Xerox WorkCentre 7556 is the perfect solution for design based businesses, or anyone who produces a lot of color prints. If you are interested in learning more about the Xerox WorkCentre 7556 then give us a call at Colorado Springs Copier. We can help you get the best lease in Colorado Springs.